Our social conversation has gone awry. We are surrounded by noise and retreating to social media bubbles. As conversations across ideological divides become increasingly difficult, we as a society need to rethink what it means to listen, to think, to create, and to be democratically engaged citizens. 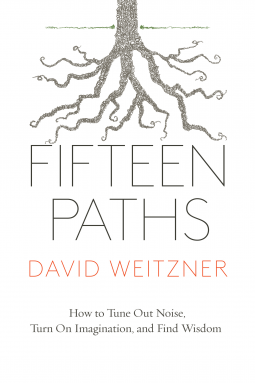 Fifteen Paths documents the journey of a disillusioned business professor who came to realize that in order to transcend the noise, we need more imaginative expressions and fewer argumentative ones. David Weitzner sought the counsel of fourteen iconoclastic artists, including Lee Ranaldo (Sonic Youth), Jeff Coffin (Dave Matthews Band), Mike Mignola (Hellboy), Lydia Lunch, and Del the Funky Homosapien. The book offers 15 concrete courses of action to reimagine a socially engaged life and an afterword documenting the surprising outcome of the author’s personal journey.